So here’s the problem I have after EVERY Thanksgiving. Do I now try to eat lighter the weeks leading up to Christmas to make up for the gazillion calories I inhaled during Thanksgiving weekend? Do I not let leftovers go to waste and continue on with the turkey, potatoes, casseroles, mac n’ cheese, and desserts until they’re all gone? Eh….let’s be honest. I’m going to continue shoveling in the last of the leftovers and THEN jump over to something lighter and easy to whip up. Which works out fantastic because our friends at The Saucey Sauce Co. had sent me a care package awhile back with a variety of yummy goodness that can be used as ready-to-go sauces or marinades. They’re a family owned group (yay for family!) that base many of their products on their Asian/Vietnamese heritage. You can find them at their online store but they’re also branching out across the country to some great retailers! 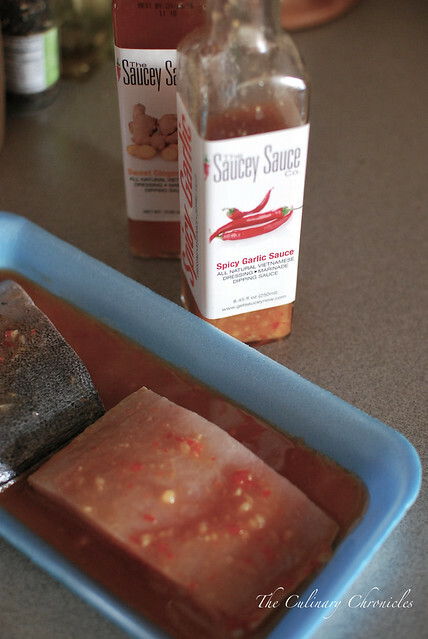 I love using the sauces to marinade chicken breasts and fish because it’s all ready to go. I’ve also tossed some chicken wings in rice flour, deep fried it and then tossed them in their Sweet Ginger Sauce — so good! After coating the fish with the marinade, I placed it in the fridge for about an hour so that it could work its magic. Once the fillets have had its fill of magic, I pan-seared the fish on a screaming hot cast iron skillet to get that super crunchy skin. And like I said on the Pan Seared Black Cod post, do not — and I mean DO NOT, try to flip the fish before it’s ready. It’ll let you know when the time is right when you can slide a spatula underneath it. To serve with the mahi mahi, I made a fragrant coconut-cilantro rice. The recipe below tells you how to make it on the stove but if you have a rice cooker, just throw it all in machine and let it do its thing. The fish turned out so delicious! The mahi mahi was able to soak up the slightly sweet, slightly spiced marinade but it wasn’t overpowering at all. And you can definitely use any other fish of your choice if mahi mahi isn’t your thing. The perfect, easy, scrumptious weeknight meal. 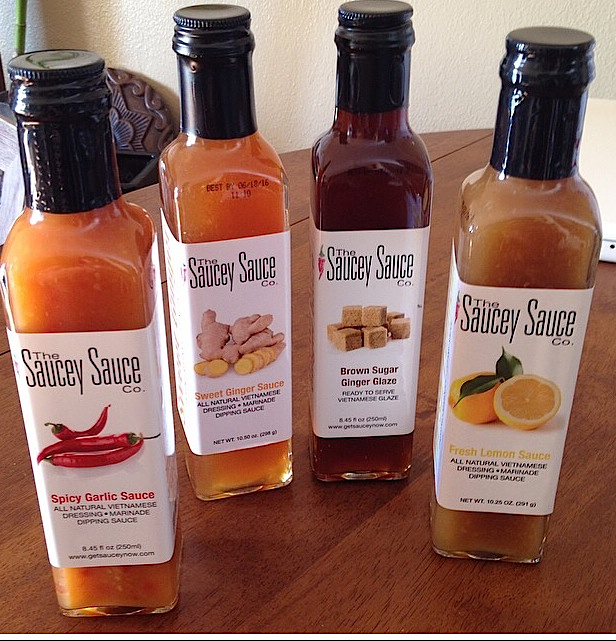 And as always, much thanks to our friends at The Saucey Sauce Co.!! In a shallow dish, whisk the Spicy Garlic Sauce, ginger and 1 teaspoon lime zest together. Place the fish in the dish and coat both sides. Cover the dish with plastic wrap and marinate for 45-60 minutes in the refrigerator. Take out of the refrigerator about 10 minutes before cooking to take the chill off. While the fish marinates, prepare the rice. Combine the rice, coconut milk, coconut water (or water) and salt in a heavy bottom pot. Bring the liquids to a boil and then lower the heat to a gentle simmer. Cover the pot and allow to cook for 18-20 minutes. Remove the pot from the heat with the cover still on and allow to sit for about 5 minutes. Once the time is up, add the cilantro and remaining lime zest. Using a fork, fluff the rice and set aside. Choose a skillet that can handle a high level of heat (ie. cast iron, stainless steel, etc.) Heat the skillet over high heat so that it becomes screaming hot. Once it reaches the desired temperature, add the oil and swirl it around the skillet. Carefully place each fillet, skin side down into the oil. Using a spatula, gently press down on the fillets so that they don’t curl up on the sides. 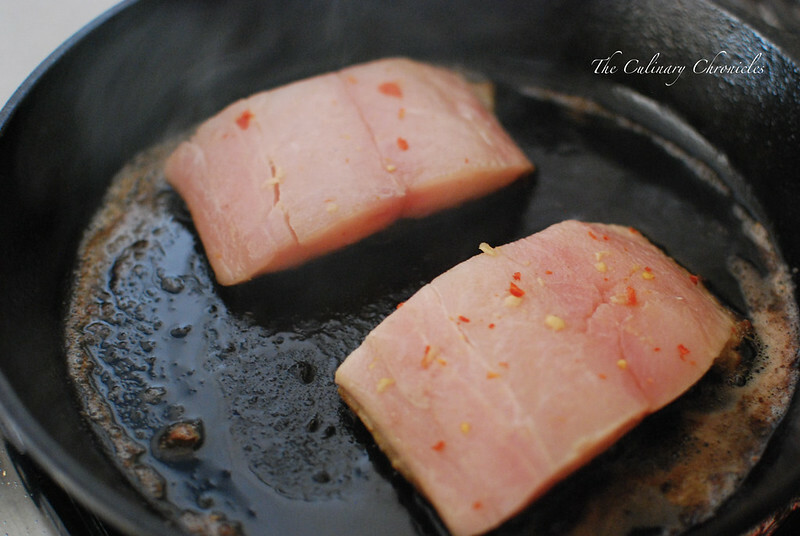 Cook the first side of the fish for about 3 minutes — depending on the thickness of the fillets. Be careful not to flip the fish before the skin has crisped up and formed a crust. Once the first side has cooked, about 2/3 way through, flip and cook for an additional 2 minutes. Remove the fillets from the skillet. Use paper towels to gently blot any excess grease off of the fillets and plate on two separate plates. 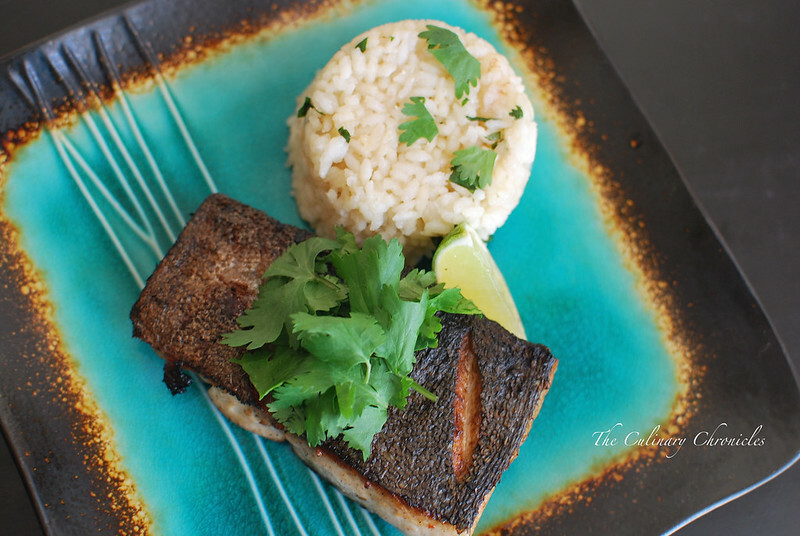 Add a large scoop of the rice on each plate and top each fillet and rice with the fresh cilantro leaves. Serve each plate with a piece of lime wedge that should be squeezed over the fish before eating. Serve warm. 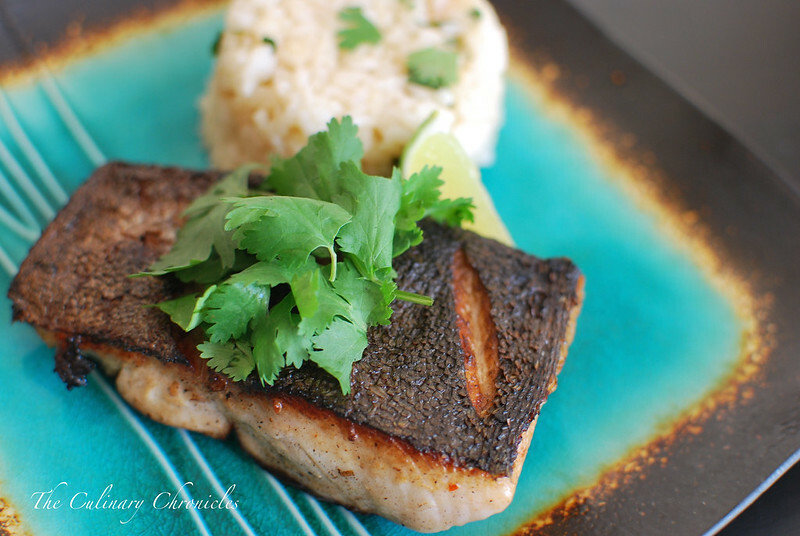 Pingback: Pan-Seared Mahi Mahi with Coconut-Cilantro Rice | The Saucey Sauce Co.